A good barbecue can be your best friend. 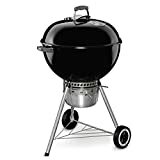 But, before you start cooking up a storm, you need to do some research, you need to find the best charcoal grill for you. It can be hard to know what you want if you are a novice griller. Have no fear, we will highlight some of the best grills of 2019 for you to look into. And we’ll even provide you with links, so you can do your own research, or even make a purchase! There are two main types of grills, charcoal and gas. Usually people are fervently in one camp or the other. But really, it’s a matter of personal preference. Charcoal isn’t that complicated and usually with practice it can be just as reliable as using a gas grill. Charcoal makes more smoke than gas does. Though when done right, good charcoal produces little smoke and won’t get into food. The smoke you see when grilling comes from the drippings from food hitting hot coals. Most gas grills cover flame jets with metal plates, lava rocks, or ceramic rocks that absorb the heat and radiate it. Drippings hit these radiant surfaces where it’s vaporized making smoke and steam like with charcoal. There is a slight flavor difference between the two though. When propane combusts it makes more steam than charcoal. Some people say that it keeps meat moist. Others think it stops chicken skin from being crisp. Another noticeable difference in taste is when you use self-igniting charcoal or charcoal fluid to start a fire, there can be a petrochemical smell during the ignition and it can get into food. use a lot of coal they can cook as hot as 700 degrees Fahrenheit. can get carbon and grease buildups that have to get scrapped off. We use a 2-part system with how we chose our ratings for the best charcoal grill. We look at what insiders think to start a list. They test them out and know some of the best brands. The only downside is that they may have unknown biases. We then looked up each grill from our list on Amazon to see what average customers thought of the product. Customer reviews are great because they have no biases. Customers will not hold back from telling people why or why not they like a product. They also can explain it in a way that anyone can understand. Here is our list of the best charcoal grills. We tried to find grills at a variety of prices so that that there is one that can fit everyone’s budgets and grilling needs. This is the ideal portable grill for cookouts, tailgates parties, and camping. Its glass reinforced nylon handle lets you easily remove the lid as needed. The cooking grate measures 14.5 inches in diameter and is triple nickel plated. The porcelain enameled coating prevents rust and fading, and it has a 10 year limited warranty. 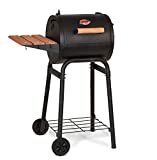 This is a charcoal grill and smoker. Due to PK’s unique capsule shape and 4 vents, it’s easy to grill hot and fast or low and slow. It’s also very portable. Cast aluminum construction is rust proof, durable, lightweight, and conducts heat 4 times more efficiently than steel grills. There’s 300 square inches of cooking space built in. This grill has a 360 square inches of total cooking surface. The 22.5 inch diameter porcelain coated cooking grate keeps food on top and prevents flare ups. It also has a hinged lid with a temperature gauge to make it easier to use. It has a removable ash bowl for easier clean up. The vent on the lid opens to let heat out and close it to increase the cooking temperature. The charcoal grate is adjustable so you can bring the food closer or farther away from the fire as needed. This kettle grill has a 22-inch diameter porcelain enameled bowl and lid, along with a cooking area of 363 square inches. It has a plated steel hinged cooking grate. You can control your heating by adjusting the dampers. Aluminized steel is easy to clean with a high capacity aluminum ash catcher. It also has aluminum rust resistant and glass reinforced handles with tool hooks. It has 2 charcoal basket adjustment tray systems for ultimate heat control options and cooking flexibility. It comes with the 4 cast iron porcelain enameled heavy duty cooking grates retain heat and sear food and locks in natural juices. There is adjustable flu cap and side vents. There’s 816 square inch of total cooking area. You can grill up to 30 burgers at a time. There’s also heavy 8-inch resin wheels with 3 inch casters provide excellent maneuverability. You get side shelves, storage basket, and bottle opener. This grill has 250 square inches of cooking space and cast iron cooking grates. It has wood handles so that they can stay cool while cooking. There is also a side air vent. It also comes with side drawer, side shelf, and easy to dump ash pan. This grill has 2 different adjustable heights that temper cooking speed. There’s a draft door that regulates heat. You can get to the coal through the back door. It’s good for picnics, tailgating, and camping. This grill has 2 side handles and 333 square inches of cooking space. It has a 2-year warranty and is made in the US. 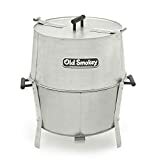 It’s made of aluminized steel and weighs only 19 pounds. have to move the grate with the food on it to add charcoal. 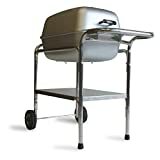 It has a 14 chrome plated grill surface and over 150 square inches of cooking space. There’s also a convenient mess-free ash catcher. 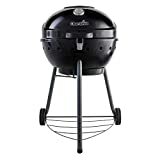 It features dual venting system for charcoal management and temperature. There are 3 secure lid locks for easy and safe transportation. grill grate seems to move a lot. This is a great value deal. You get a shish kebob, grill, and fish and meat smoker. It’s coated with professional grade black powder coated finish that can stand high temperatures and will last a while. The rotisserie motor will automatically rotate your kabobs for you. It has a built in thermometer. It also has 11 custom 23-inch-long heavy-duty skewers made just the grill. the holes for the skewers are hard to see at first. You need to think about what you want to use your grill for before you choose one. If you are a casual griller, then you don’t need a fancy grill. If you prefer more complex cooking than you need one that can keep up with you. Make sure to read the reviews. These are from the people who have tried them, and they will tell you if they work or not. Many people will talk about how the grill arrived, if it’s easy to set up, and if it works properly. 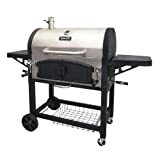 If you really think about what you want from your grill before you buy it, it will be easy to find the best charcoal grill for you. Think about how much you will be cooking at a time, if you need it to be portable, and how much you can spend. Once you know all that, there will be a grill that stands out from the rest. Get grilling!